Smart Manufacturing Hub, North Building, Level 3, Booth 236800 connects with the leading thinkers and doers in the manufacturing industry. The Smart Manufacturing Hub will feature hourly presentations on the most advanced and innovative solutions. For a lot of people, the idea of trusting your life to a computer hurtling you down the road sounds foolhardy. The whole idea behind the autonomous vehicle is to eliminate human error and deliver zero street/road fatalities - awesome, but impossible. 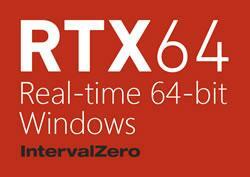 RTX64 turns the Microsoft 64-bit Windows operating system into a Real-time operating system (RTOS). RTX64 enhances Windows by providing hard real-time and control capabilities to a general purpose operating system that is familiar to both developers and end users. RTX64 consists of a separate real-time subsystem (RTSS) that schedules and controls all RTSS applications independently of Windows.RTX64 is a key component of the IntervalZero RTOS Platform that comprises x86 and x64 multicore multiprocessors, Windows, and real-time Ethernet (e.g. EtherCAT or PROFINET) to outperform real-time hardware such as DSPs and radically reduce the development costs for systems that require determinism or hard real-time.